edited and blogged ... stay tuned for that! 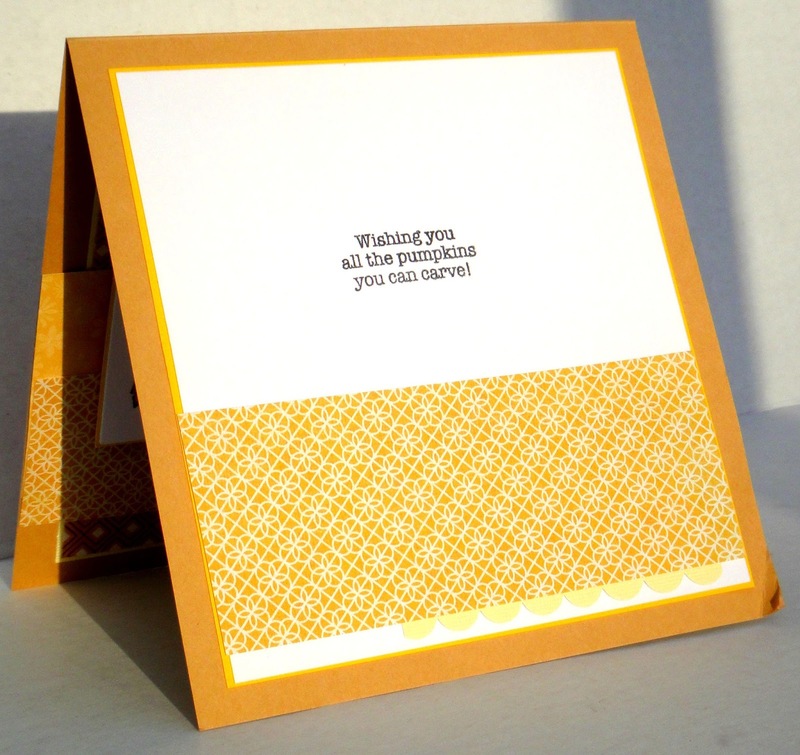 make sure you stop by, the cards and inspiration are something to behold! 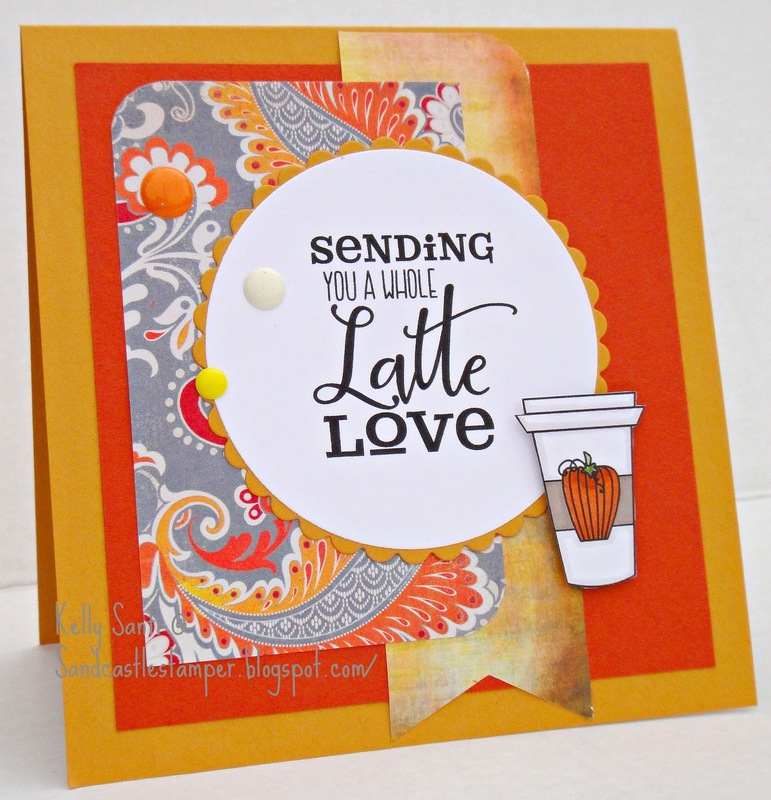 and I just knew I wanted to make a card ~ cards, coffee? So me! 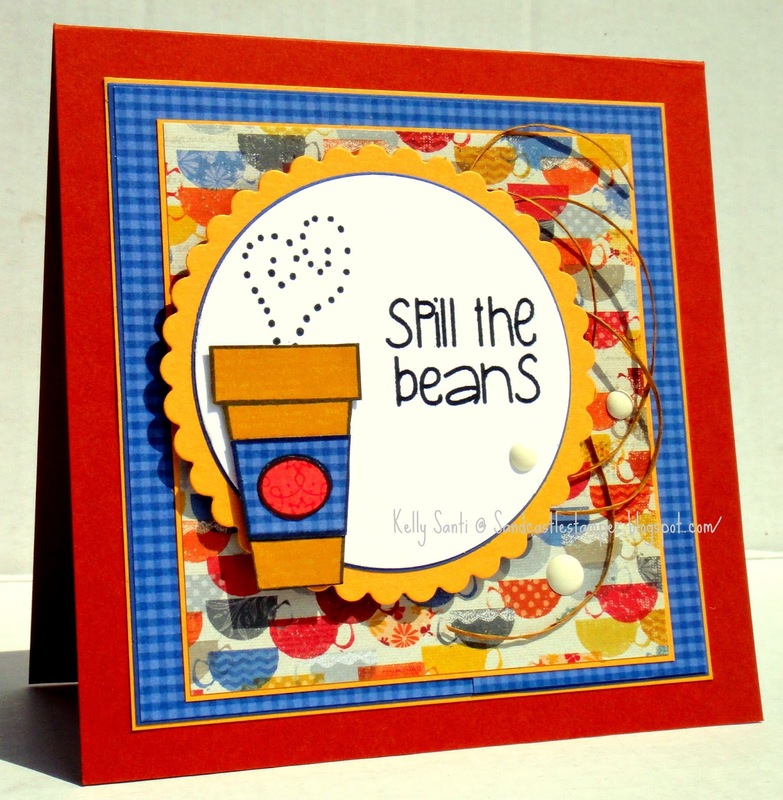 inspirational card designs and so much more! The hop has wonderful sponsors, talented crafters, giveaways ..
so be sure to take a peek! the Breakfast Club from The Alley Way Stamps. right onto the paper and propped it up with 3d foam for dimension. I'd also like to enter this into Colour Me: Playful! with the theme "Send in the Clowns!" of my day, every day! words in a busy day to always have fun! so I was thrilled to find this clown + circus themed dsp in my stash - score! I hope today is a fun one for you, too! It's the Dueling Darlings ~ *Tutti Fruity* Style! Woohoo! The long awaited return of the DDD card kit group is here! 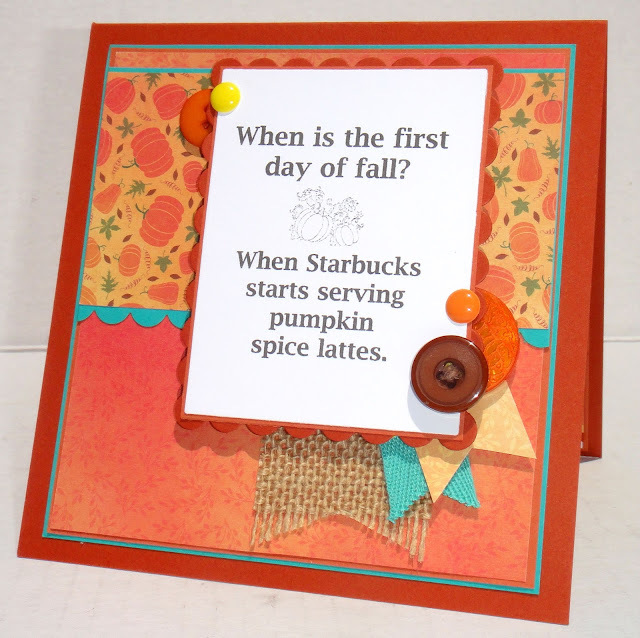 We've been on a summer hiatus but are thrilled to be back "dueling" for the Fall! For my new blog readers, you might be wondering what the DDD is! almost all of us are original members. we have 3 new friends joining us! 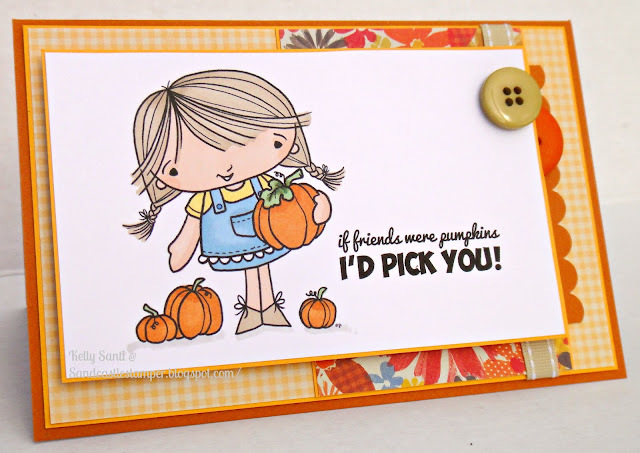 dear friends of ours from many of the threads on Splitcoaststampers! Each month, two opposing teams have a hostess that pairs up and choses a theme, one hostess for Team Diva and one for Team Dazzlers! then post on the 15th to see what each of us made with that theme. This month, Jeanette and I are the hostesses! 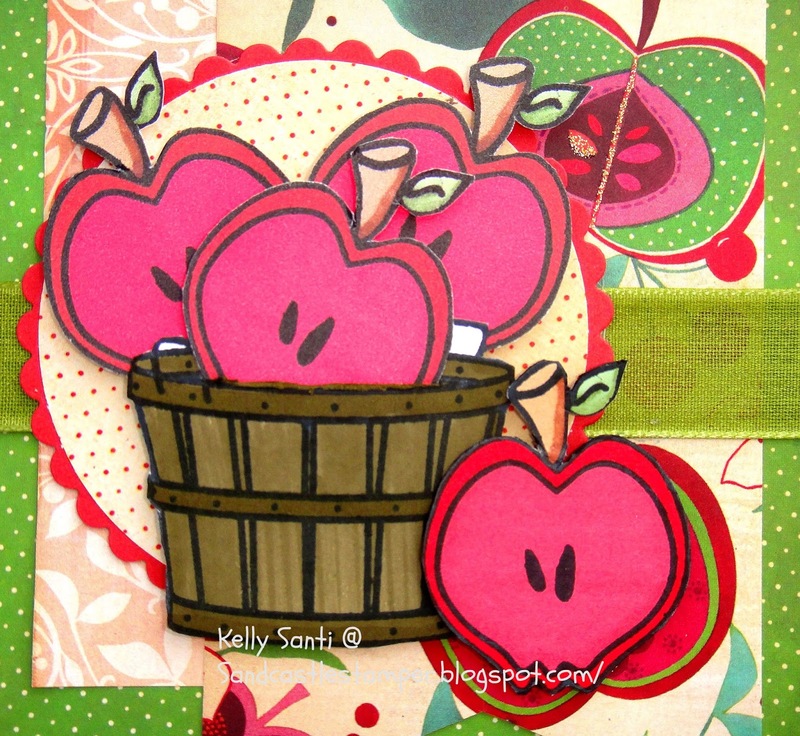 Since Autumn is now upon us, the Divas are going apple picking! as you took that first bite – Yum! 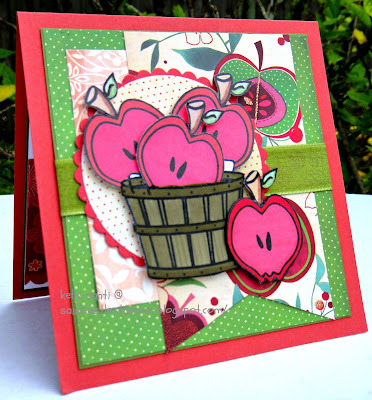 filled with apples and apple blossoms. This paper is lucious! 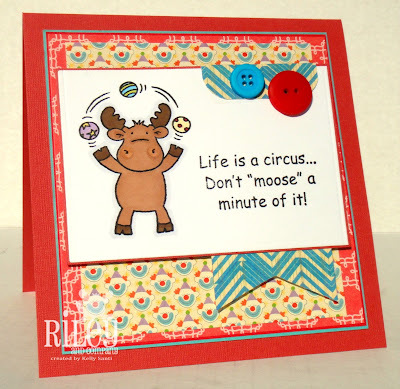 Very few embellishments adorn today's card because it just got too busy. this side view shows a bit of the dimension. Mine is Starbucks Pumpkin Spice Latte! 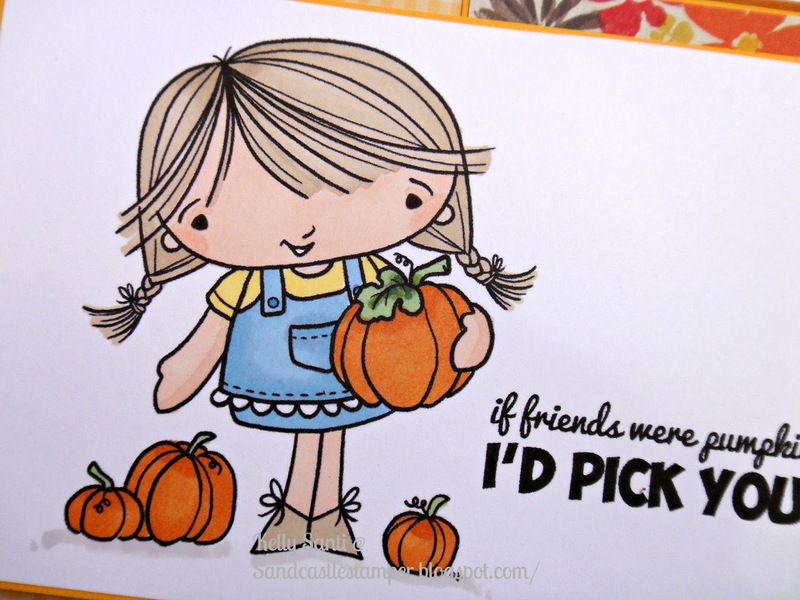 please see the entire list of friends in my sidebar off the right! in this wonderful blog world we share! 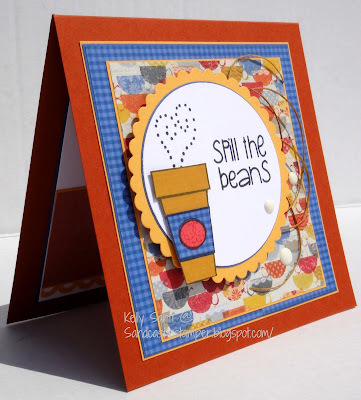 and I've been trying to post this card since Tuesday! I recently purchased some digis at From the Heart Stamps including this one, September's stamp of the month image. 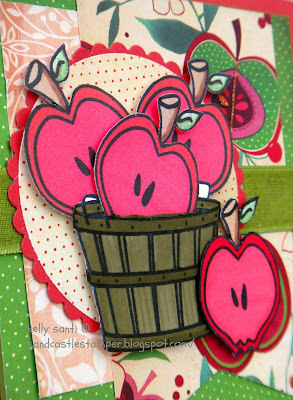 I'm happy to be back and just absolutely adore this month's image! first time using this digi, like the wonderful Crate Paper 'home' dsp and that little peek of River Rock ribbon that I've hoarded had for awhile! I'll also enter my card in the monthly challenge at FTHS. We've been busy having a BIRTHDAY today! as special as it could be with lots of wake up excitement, special outings, his favorite restaurant, cake and ice cream and gifts! beautiful Great Impressions Harvest Cart stamp from Barb! 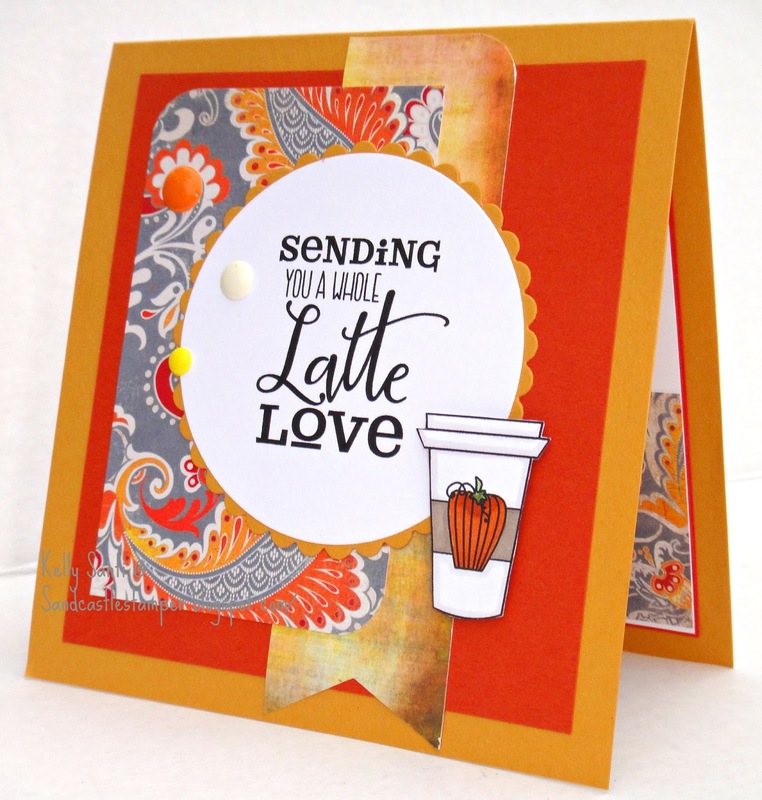 another Autumn themed stamped image as it's such a beautiful season. 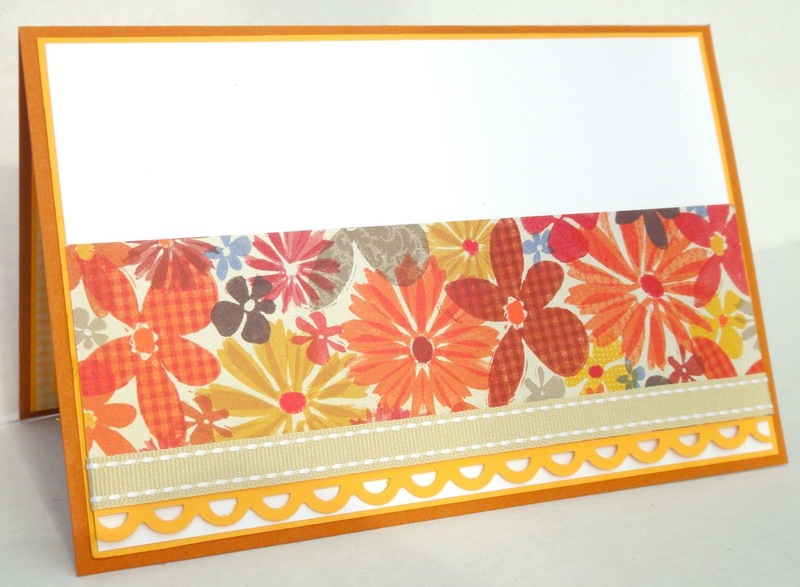 I've also used up some papers from my never opened Basic Grey Herbs and Honey mat stack in "harvesty" colors and ...added some buttons! Now that I see it, I'm thinking I should rename my blog to Banners 'N Buttons! 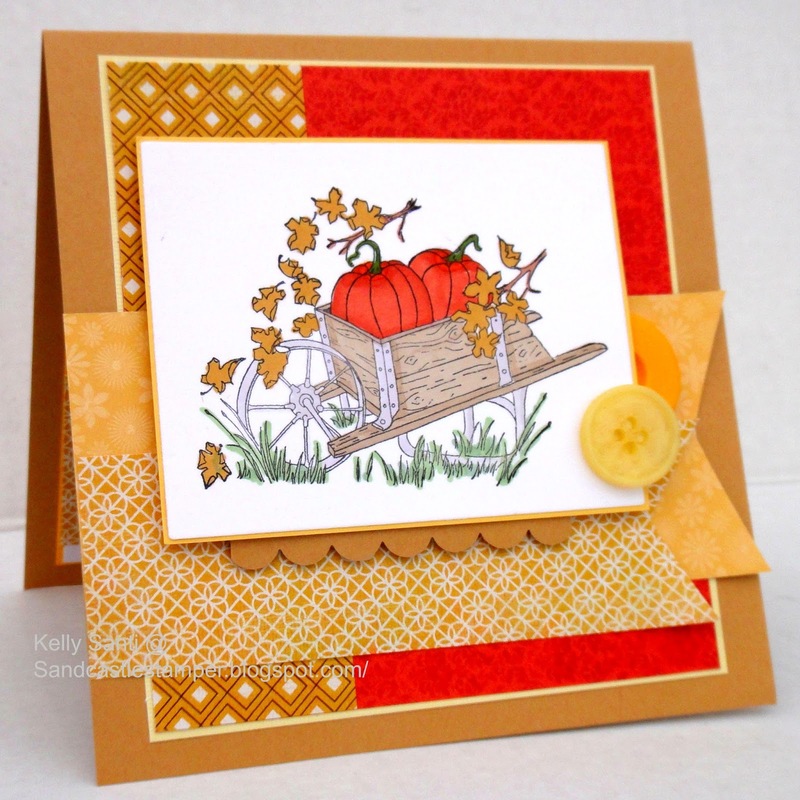 this beautiful harvest cart as well! Ill enter my card into: FanTastic Tuesday- AG, Square! inside and outside the house! it's starting to look a lot like Autumn! 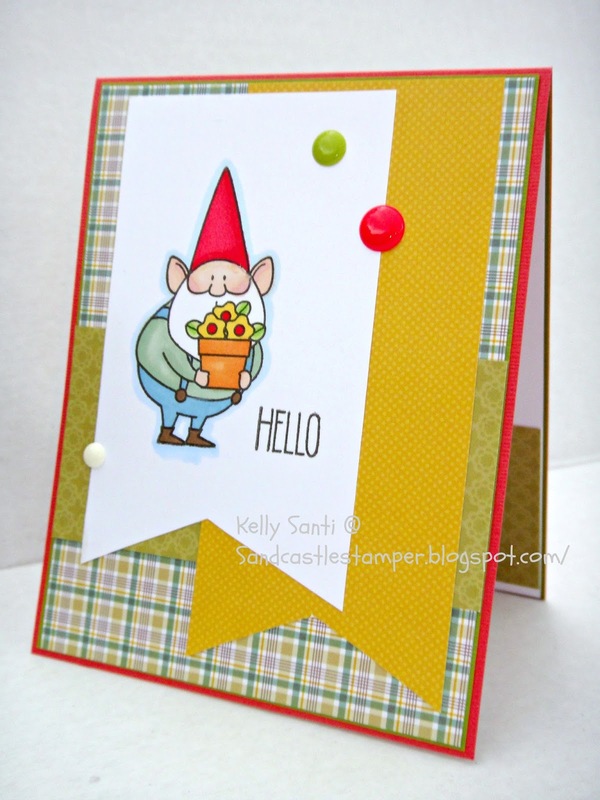 Today's card is pretty CAS compared to my usual layers and buttons 'n such! 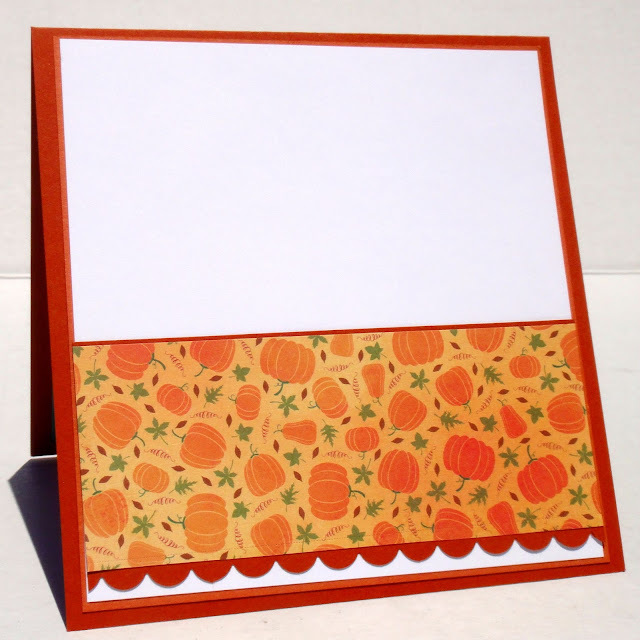 Since this card has to be flat for mailing, I kept it simple! I colored him in traditional Gnome colors with my prismacolor markers. 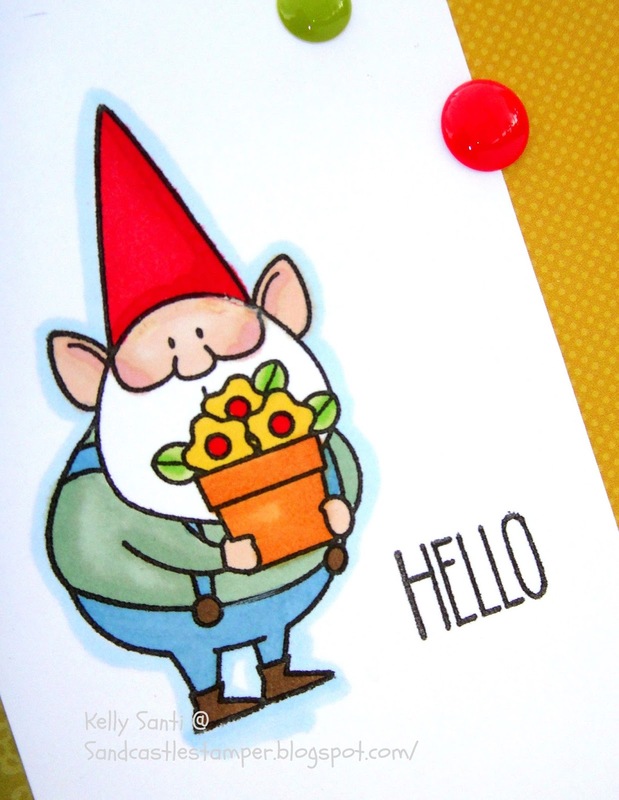 From my Gnome to yours, enjoy! Riley's going "Back to School!" back and forth and back and forth and then some! 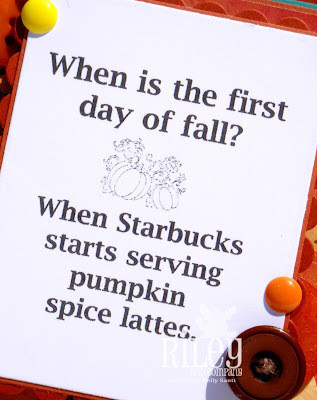 Which means a lot of trips to Starbucks! 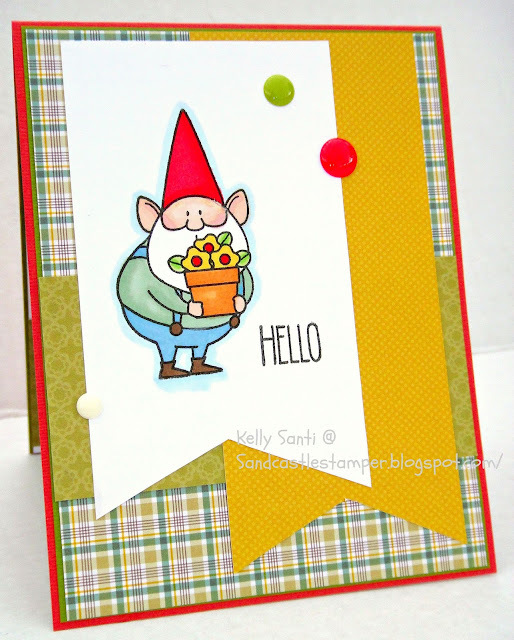 on the Riley and Company blog and our challenge is hosted by Sandye. create a School related card or project. For me, driving by for my 'Bux and meeting my treasured friends is one of the highlights of school! the DT will still bring to you biweekly inspirational cards and projects! 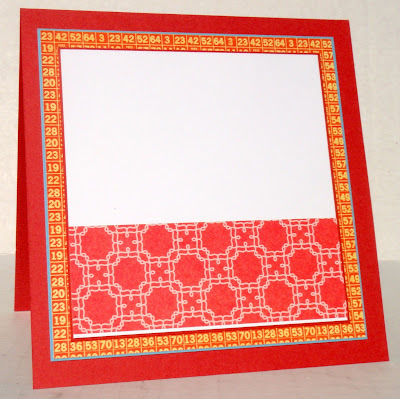 Every other week, the DT will showcase the stamps from the store!